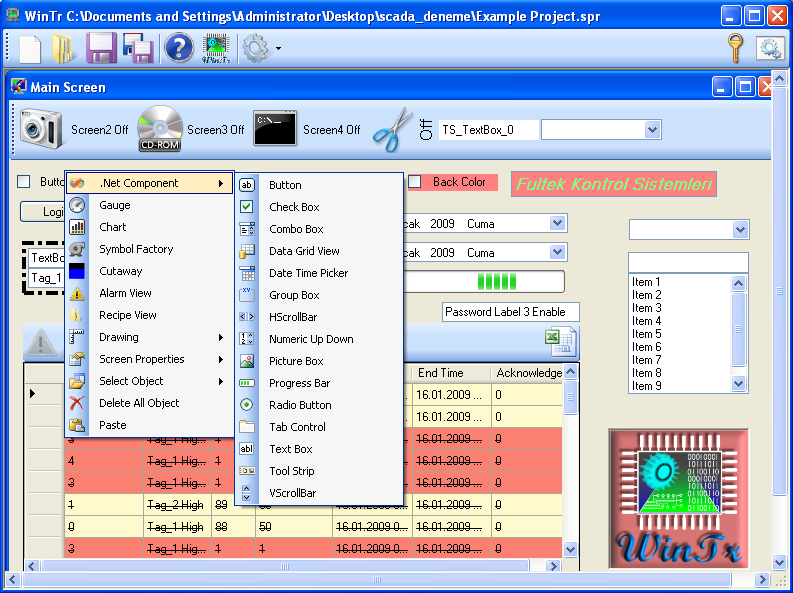 WinTr is advanced SCADA Software for monitoring and saving datas of manufacturing processes which seperated large areas. 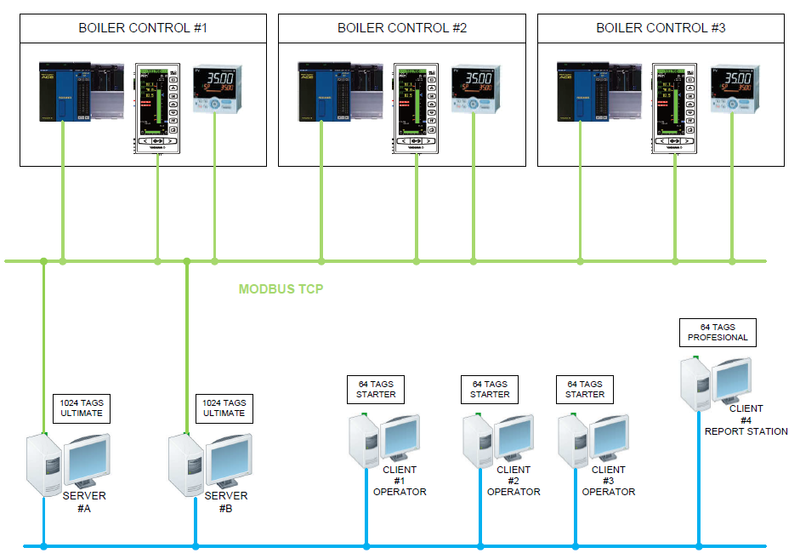 Devices managed from single station and they can be connected with OPC Client, S7 MPI,S7 PPI, Profinet (S7 1200), Modbus RTU(Delta plc and other), Modbus TCP/IP(Delta plc and other), Host-Link protocols(Omron), Mewtocol protocols(Panasonic). 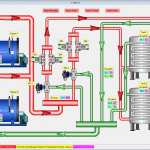 SCADA Systems Historical datas related to processes are saved into database. Latest Version: 5.5.3(28/02/2019): Screen resize(scale) function was added. Webserver performance improved. Click here to see version history. 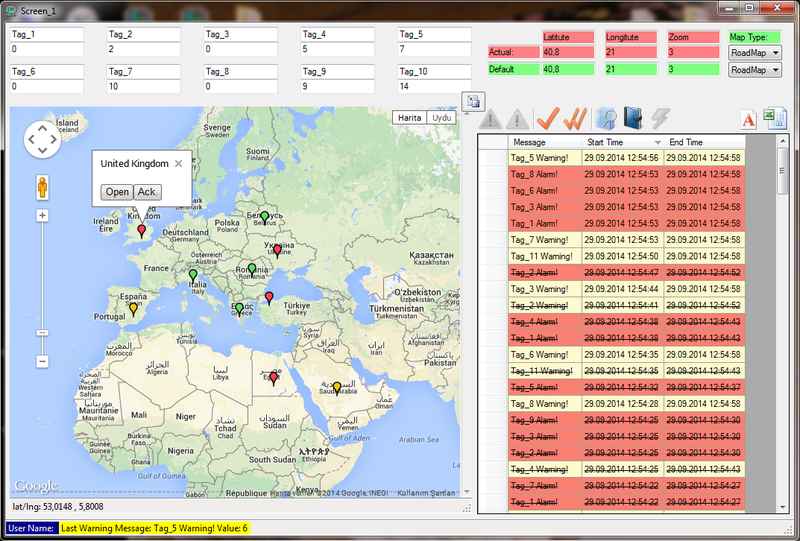 Alarms and Warnings can be defined for process values. 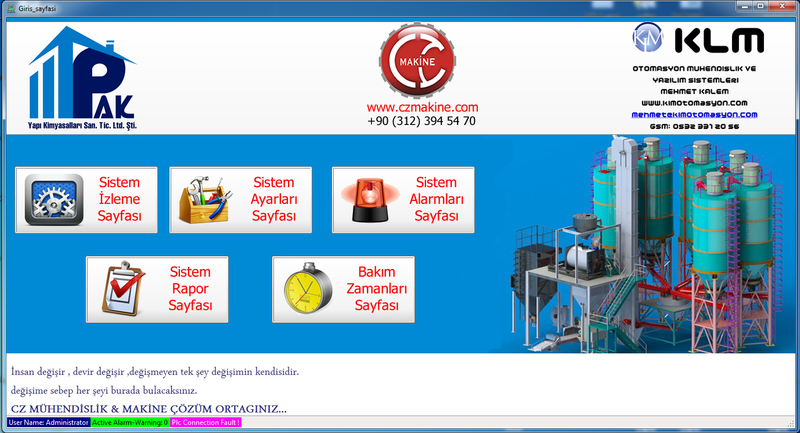 When alarm or warning occurred, it can be monitored in the Screen real time and informed to E-Mail and SMS recipients. 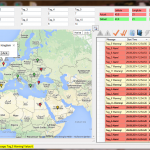 Easily creates detailed Reports from historical datas and saves them in Excel or PDF format..
With Recipe, previously saved values for the tags are send to the devices by one click. Microsoft .NET Framework’s Button, CheckBox, RadioButton, Combobox, NumericUpDown, Horizantal ScroollBar, Vertical ScrollBar, ProgressBar, Datagridview, DateTimePicker, TabControl, GroupBox, PictureBox, TextBox, Toolstrip objects. Unlimited flexibility withVisual Basic and C# scripting. Uses Microsoft SQL Server (2005,2008,2012,2014,2016) databases. Limited 4gb for 2005,2008,2012 and 10gb for 2014,2016. Unlimited table and each table limited 950 Tags. With Server-Client option WinTr stations can be run synchronously through Internet and Screens can be monitored on remote computers by web browsers such as Internet explorer. EventView: You can show each operator action. AlarmView: Impressive alarm interface. Have too many abilities. ReceipeView: You can create unlimited and flexible recipe. Gauge: You can design wonderful gauge with award-winning gauge object. Vb Script, C# Script Synchronous and asynchronous operation. SQL Server 2005,2008,2010,2012,2014,2016 Express edition. Web Server, Server & Client, Redundant, Print Document, Barcode reader & writer. ActiveX and .Net object support. 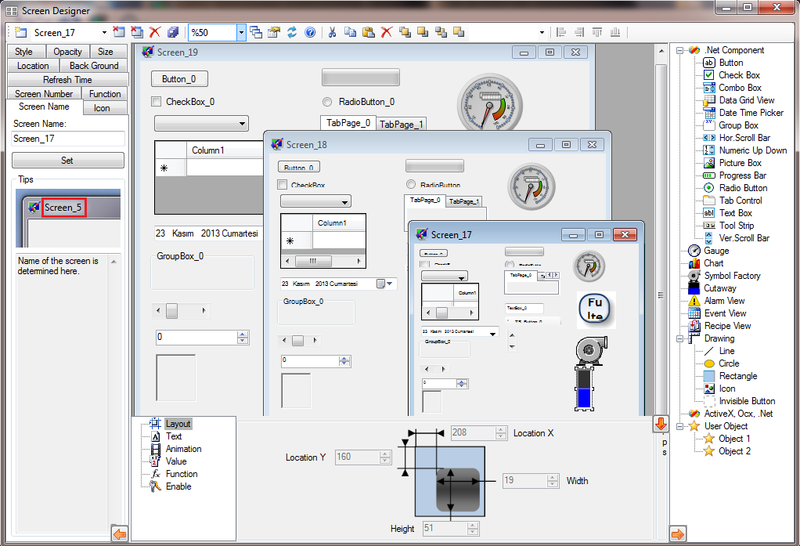 You can add special library in SCADA Software. WinTr is sold acoording to External tag number. 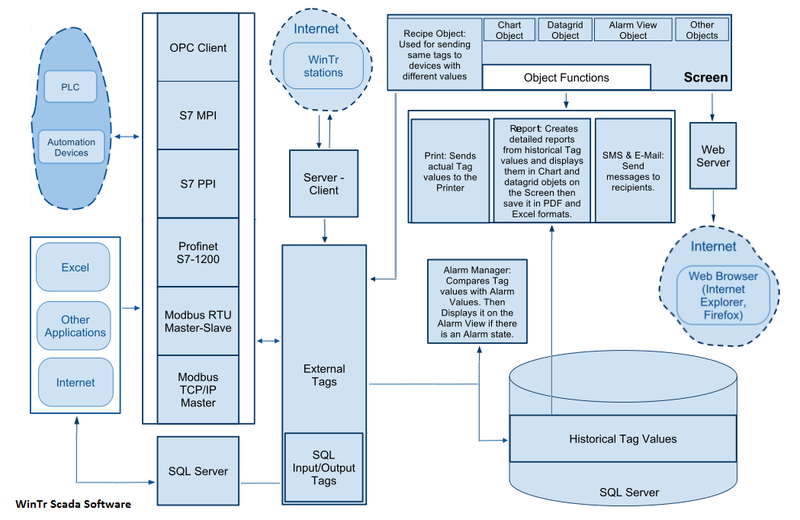 External Tags are: OPC, S7MPI, S7PPI, Profinet(S7 1200), Modbus RTU / TcpIp and SQL Server 2005 Tags. There is no limitation at Internal Tags. And no limitation at the Tags being historical. What is the main difference between WinTr and other SCADAs? Why should we prefer WinTr? 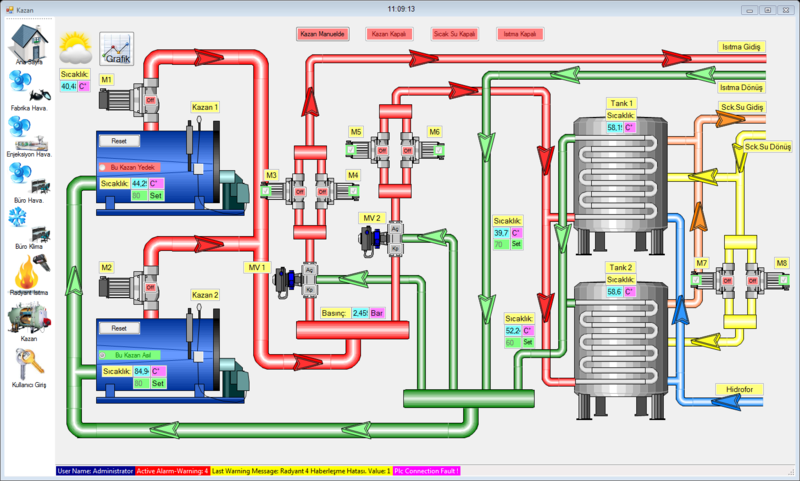 WinTr Scada is sold with 3 years free upgrade warranty. 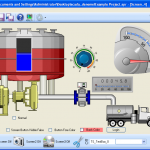 WinTr Scada development is free, runtime and development are sold together. Compatible with all Windows operating systems. Many .NET objects that can not be found other SCADAs presented in WinTR. Thus your project get out of Windows 95 look and gets Windows 10 apperiance. We are taking to your service award winning chart object dundas chart and gauge. 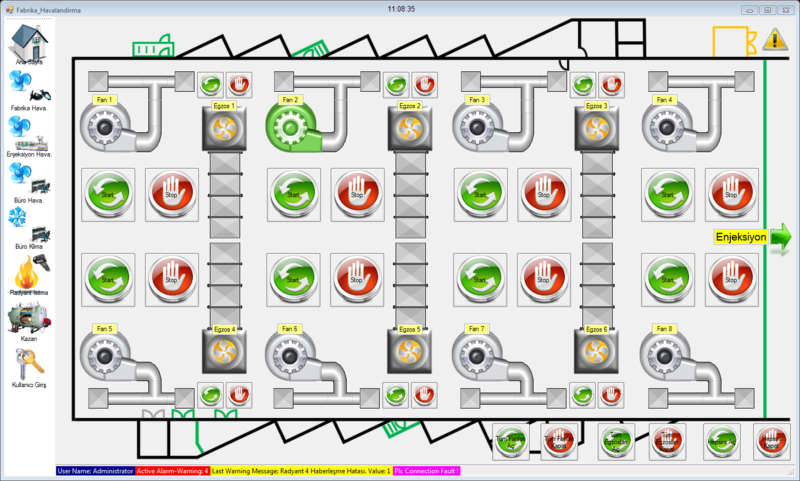 WinTr is the only scada software that uses this variation and visuality. Reaching Scada variables is very easy with SQL Input/Output tags. You can reach easily with other programs that you developed or internet browsers or excel. Many scada software export data to excel. WinTr can do this too. But the method mentioned here is different. In this method, scada never reaches excel. 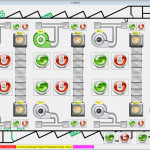 Excel reaches to scada via excel macro. VB and C# scripts are work completely different. Scada softwares has a restrictions at script functions. However Wintr has no restrictions you can perform many operations by writing scripts almost as if developing program on .NET platform. 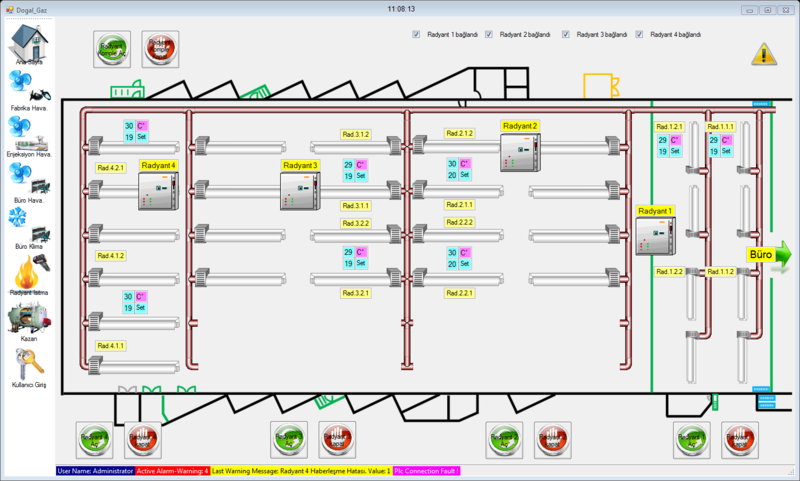 It is possible to reach and modify scada informations other than the scada tags with scripts. When such needs occur we provide information our customers freely. We develop needed scripts for our customers some case free some case with fee. Scripts are compiled once at first then saved as .Net DLL. Then runs directly. Thus they run faster. Even huge amount operations can run very fast in the script. 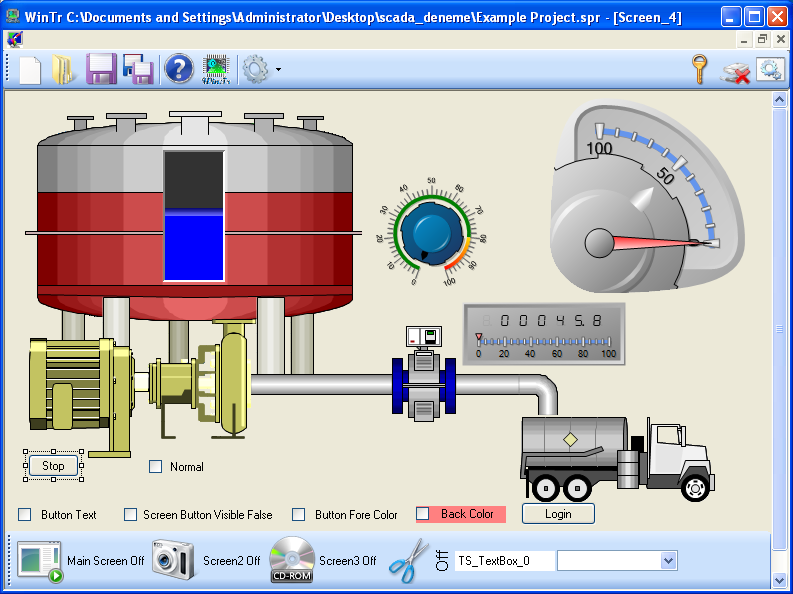 At many scada, the function number which can be run by a button or other object are limited. However 256 function can be run with WinTr Also you can trigger this functions when alarm occured or gone. You can use unlimited object in screen. 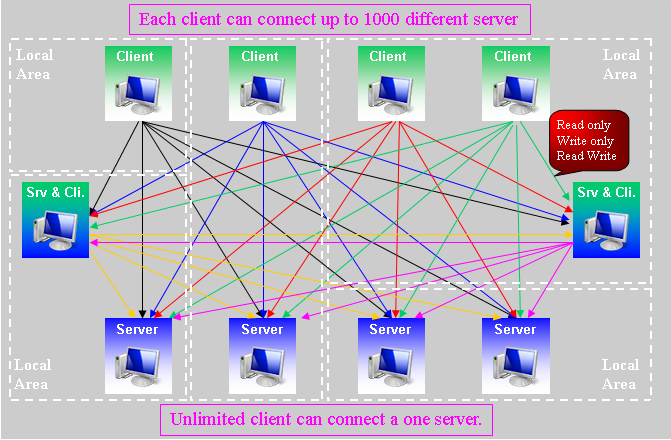 Thousands WinTr scada may establish full or restricted access to each other via server and client functionality. 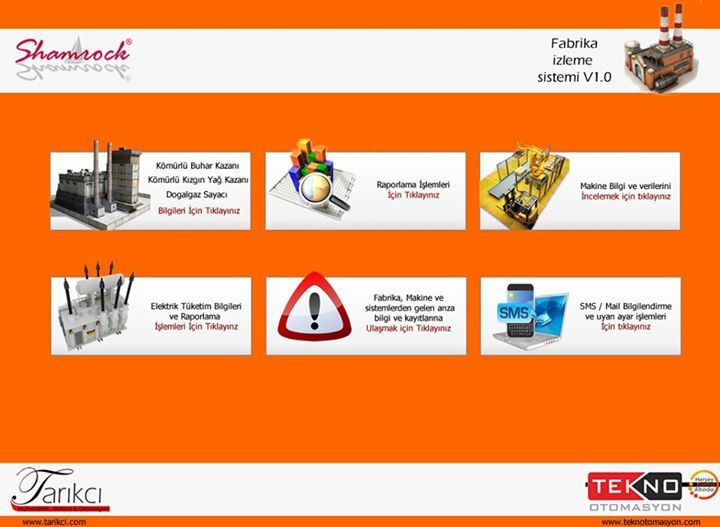 Can be connected to automation devices via S7 MPI, PPI, Profinet, Host-Link, Mewtocol and modbus RTU without OPC server. Also you can use OPC Server for other protocol. E-mail and SMS sent when specified conditions occur. You can create many different recipe algorithms with categorized recipe. 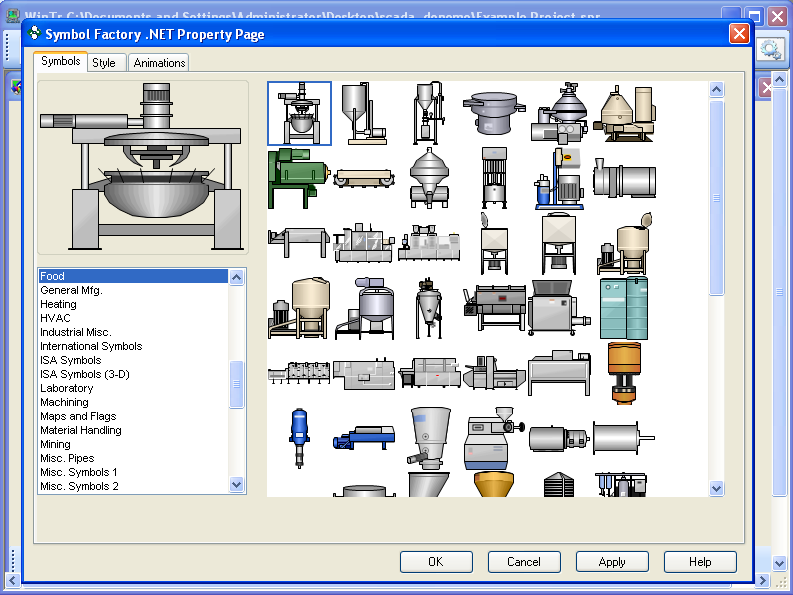 Beside many image file you can use animated gif images in scada pages. We present all of this excelent features with low price. 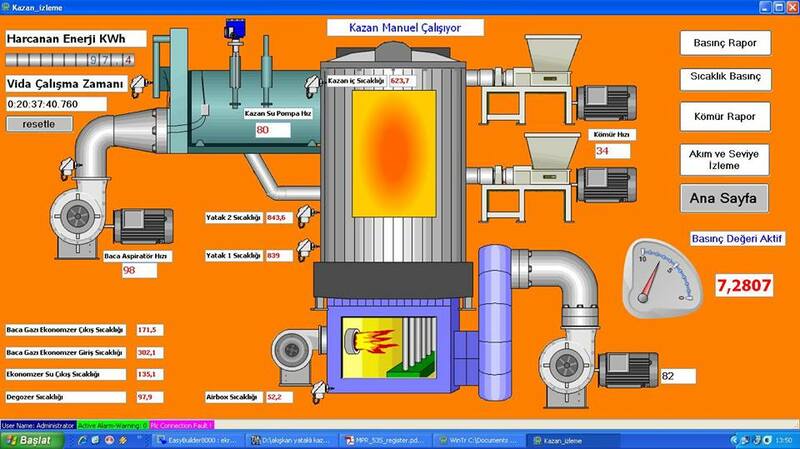 You can see more scada screen pictures click here. 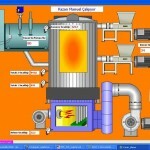 Download: How to make first scada project ? 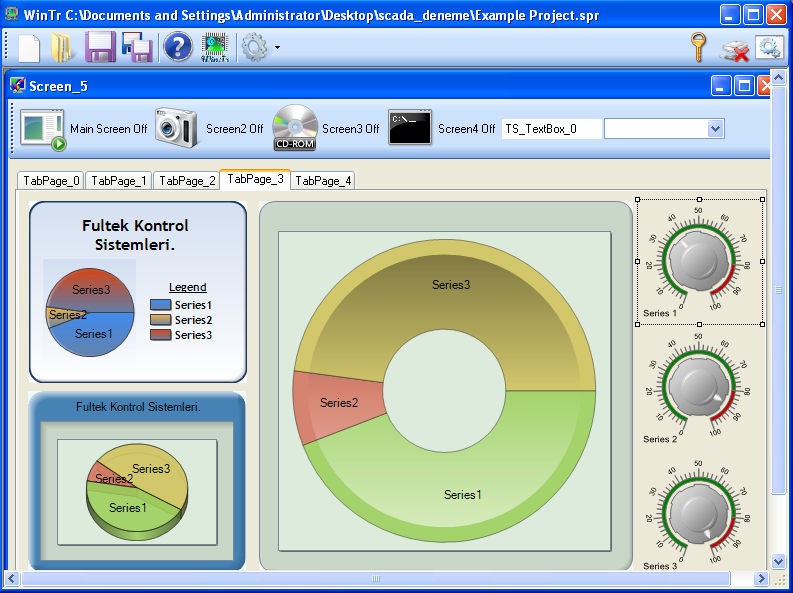 , Scada general features. 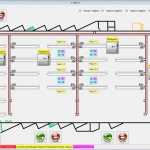 , How to make reports in scada? 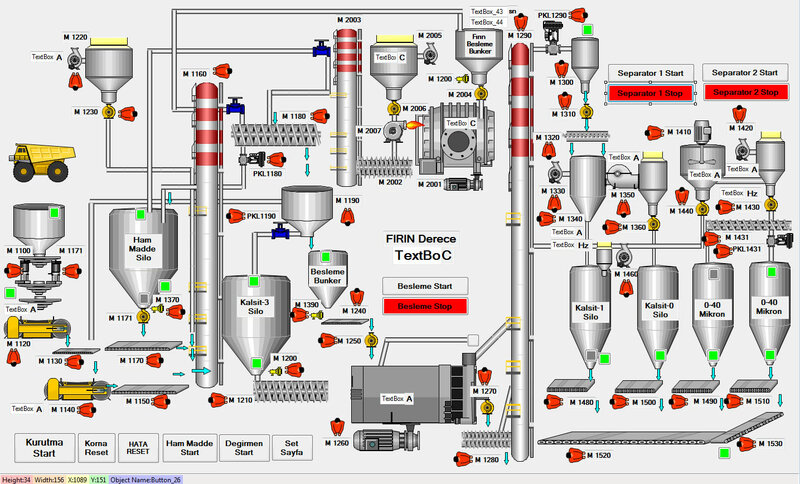 , How to get print out from the scada? 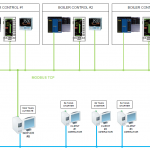 , How to set scada as server & client? 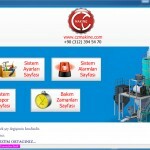 , How to use web server feature of scada? 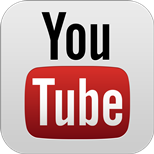 You can download necessary video codec file here. 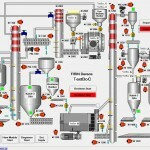 You Tube: How to make first scada project ? 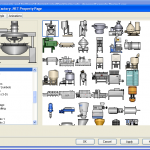 , Scada general features , How to make reports in scada? 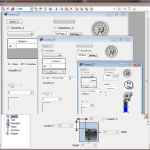 , How to get print out from the scada? , How to set scada as server & client? 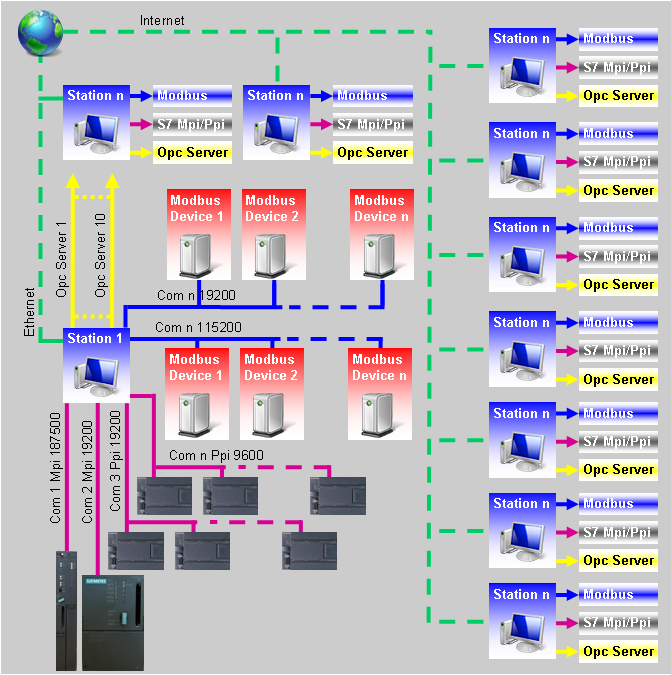 , How to use web server feature of scada? Free Shipping all of the world. * Webserver Controllable Object: Button, Checkbox, Radio Button, Picturebox, SymbolFactory, Cutaway, Drawing, invisible Button, Textbox, Numericupdown, Horizantal Scrollbar, Vertical Scroolbar. Other object read only. 64 128 Usd. 228 Usd. 478 Usd. 728 Usd. 128 256 Usd. 356 Usd. 606 Usd. 856 Usd. 256 512 Usd. 612 Usd. 862 Usd. 1112 Usd. 512 768 Usd. 868 Usd. 1118 Usd. 1368 Usd. 1024 1024 Usd. 1124 Usd. 1374 Usd. 1624 Usd. 2048 2048 Usd. 2148 Usd. 2398 Usd. 2648 Usd. 8192 4096 Usd. 4196 Usd. 4446 Usd. 4696 Usd. 65535 XXXX XXXX XXXX 8192 Usd. Unlimited XXXX XXXX XXXX 16384 Usd. Upgrading price is amount of the difference between new licence and current licence. With new version licence upgrade is processed by the application that arranged for you. These application’s price is 50 usd. You need a two identical(same configuration) licence for fully backed up working of two computer(redundant). 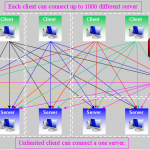 Client-Server architecture is different than Redundant system. Client reads tag value from the server. The 64 Tag client can read all values of unlimited tag server. On the client side tags which read from server are considered as ‘internal’ tag. On the other hand redundant system works one on one synchronize. If one computer disabled all operation taken on the other computer. Scada Tutorial Video: How to make first scada project?